Editor's note: This page contains information about Super Bowl parking in Indianapolis. For information on the upcoming Super Bowl in New Orleans, visit the Super Bowl 2013 Parking Guide. Finding a parking space in downtown Indianapolis during the Super Bowl week will be a tough task both for local residents and out-of-town visitors. Many garages and lots will be set aside for use by the NFL and corporate sponsors. Most meters will be closed. Other spaces will be replaced with tents for parties or other events. Traffic restrictions surrounding Lucas Oil Stadium and the Indiana Convention Center could make it difficult to access the remaining lots. Several parking garages and lots allow you to make a parking reservation (book now) before you head downtown on gameday. Booking early means you can plan your route into the city and know exactly how close you'll be to Lucas Oil Stadium for the big game, or the Indiana Convention Center for the NFL Experience. It won't come as a surprise that parking spaces closest to the action are most expensive, up to $495, but that allows you to set up a tailgate and stick around for several days. If you do plan to tailgate, make sure the lot where you're booking allows it. The league has agreements in place reserving hundreds of spaces around downtown for use by game attendees. The spots are available for $60 per space plus the cost of Fedex shipping and will only be sold to verified and approved ticket holders. The NFL-controlled spaces in some cases are several blocks from the stadium and are pricier than some privately managed lots, so depending on availability it could be a better bet to opt for a private lot. Reservations are recommended (See above). More information on permits for NFL-controlled spaces is here. Downtown has hundreds of metered street parking spaces that typically are the best option for visitors. But all of the spots within several blocks of Lucas Oil Stadium and the Indiana Convention Center will be closed during Super Bowl activities due to traffic restrictions and reserved parking. Plan to arrive very early and willing to walk if you want to park using a meter. Meters are free on Sunday. Checking out Super Bowl Village or NFL Experience? You can reserve a spot in advance for one of downtown's numerous parking garages or lots. Another option is Circle Centre mall, which plans to charge a $20 event rate for up to 8 hours of parking and $40 for 8-12 hours, starting Jan. 27. If you opt for Circle Centre, make sure to have a back-up plan since the garages tend to fill up fast. The mall is planning to charge an $80 flat rate on Super Bowl Sunday. Park and ride to the NFL Experience, Super Bowl Village - SOLD OUT!! 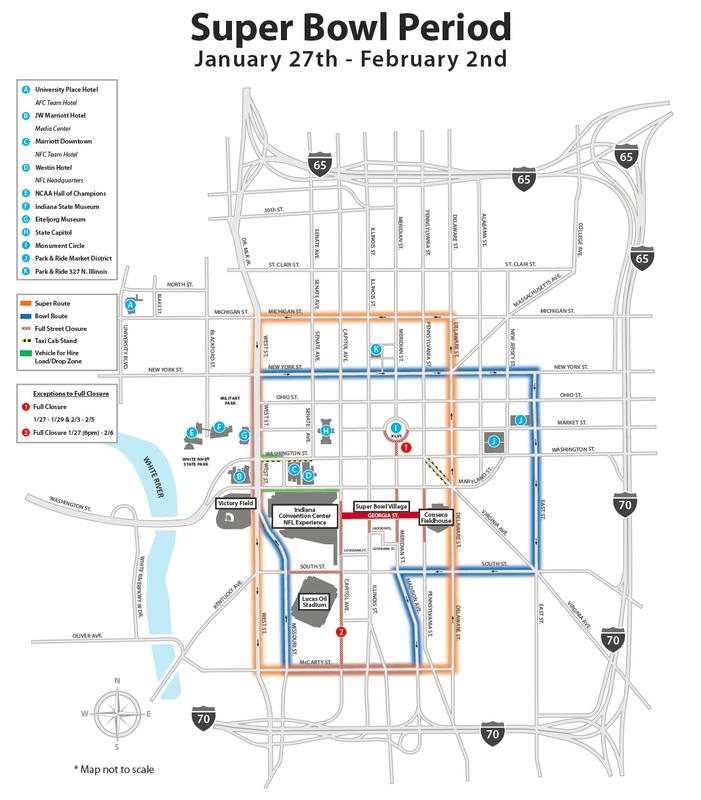 The Super Bowl Host Committee has arranged a special park-and-ride option for downtown visitors. Shuttles will run from Friday, Jan. 27, to Saturday, Feb. 4, picking up at the parking garage at 327 N. Illinois St., the old airport's long-term parking lot at 2155 S. High School Road, and the Market District Garage at 101 N. New Jersey St. The $2 park-and-ride spaces are sold out. During weekdays, the Indy Express Bus runs from Carmel and Fishers to Indianapolis for $5 each way. The service also plans to add Saturday service on Feb. 4. Details are here. And starting Feb. 2, the Super Bowl Host Committee plans to offer a shuttle service to downtown from several area shopping malls, including Greenwood Park, Clay Terrace, The Fashion Mall at Keystone and Metropolis Mall. Pick-up times and locations are here. Still have questions? 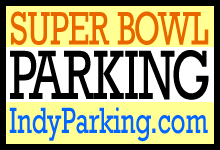 See our Super Bowl Parking FAQ. Editor's note: Links have been updated to provide information on parking in New Orleans for Super Bowl 2013.